A Secret (Garden). I knew right away that I wanted to use the flower from Peaceful Petals and the sentiment from So Very Grateful. I also knew I wanted to place the flower in the center of this square. Oops! No can do – the stem on this flower is short. How could I extend the stem? Simple. There’s a stem in Secret Garden that would pair well with this flower. A Unique Banner. I like the look of a layered banner, and it’s really easy to achieve. I cropped a Coastal Cabana banner from the Banners Framelits and then cropped a smaller banner in Whisper White, Calypso Coral and Always Artichoke, layering them really close to one another. I popped this collection of banners off the right hand side of the Coastal Cabana banner. Texture, Texture, Texture. I’ve always said that texture is important on a card, right? This card doesn’t have very much texture, but it has a bit of faux texture. The outside panel of paper is the Epic Day This & That Designer Series Paper. While there’s not enough paper here to tell that it features a map, there’s enough texture on this paper to add interest. The Hardwood background stamp adds a nice appearance of texture to the center of card. The banner and snipped flower also add texture. Thanks for stopping by today! I have a new video for you tomorrow, and I can hardly wait to share it with you. Weekly Deals. It’s Tuesday, which means Stampin’ Up! has released its Weekly Deals. Woo hoo! Here’s your chance to save on some great current products. Please click on the banner below to see the Weekly Deals or check out my page for specials and promotions (CLICK HERE). Spring One-for-One Card Swap. This is the last week to get your swap card to me, so PLEASE make sure it’s in the mail today or tomorrow. I already have three bags full and can’t wait to share them with you. These are wonderful, and you’ll want to make sure you receive one. You mail me a handmade card and get a handmade card in return. For more information, please click here. I just got this beautiful Hard Wood stamp and I totally love it Brian, the detail on it is so real, it makes beautiful background no matter what color of CS or ink you use with it. I love this pretty flower too from Peaceful Petals, all the other stamps in this set are beautiful as well. I just wish there was a die for it, it’s hard to cut them with the scissors. Love the pop of Costal Cabana under the sentiment, it really looks fabulous. Brian. You rocked the color challenge. Brian your creations are beautiful as usual. The card you posted yesterday and today I really like how the colors come together. Thank you for sharing. Have a Great Day! Oh my! Gorgeous! You pulled off this color combination with your usual magic! And I am kicking myself for not adding the woodgrain stamp to my order! It is going on the wish list now! High five, Brian! Love this card – what is the size of the base card please? Would like to CASE it if you have no objectons, Brian? Angela, Thanks. I’m glad you like it. The base of this card is 5-1/2″ x 5-1/2″. The other layers scale in from there. Your talent just radiates from every beautiful card you create! I absolutely love the triple stacked banners and with the wide banner of Coastal Cabana making everything pop. Rustic with the Hardwood background and elegant at the same time. Yes, I love it! Awww…thanks, Lisa. You are always so kind. I had a lot of fun with this banner. Love your take on this color combo, Brian! I too, was skeptical at the start about those three colors, but you’ve done it justice. Just beautiful! Well…thank you for telling me about those stems ! I would not have guessed you switched ….my goodness you are the clever one . Pretty card and yes,that Hardwood Background Stamp is a keeper . I think everybody should have this one in their collection ! Color combo turned out great and the banner stacking is super ! Yay for you ! You nailed the color combination, and I LOVEEEEEEEE this card!!! The layered banner is what does it for me. It gives those colors someplace to shine together again! Thanks for keeping me inspired, Brian. Stem not right? Just call Brian, the Magician! You are so clever! Love this card!!!! As I love so many of your cards!! Clever way to “extend” that stem, Brian! I love your banner treatment too…and it all looks fabulous on the woodgrain BG! 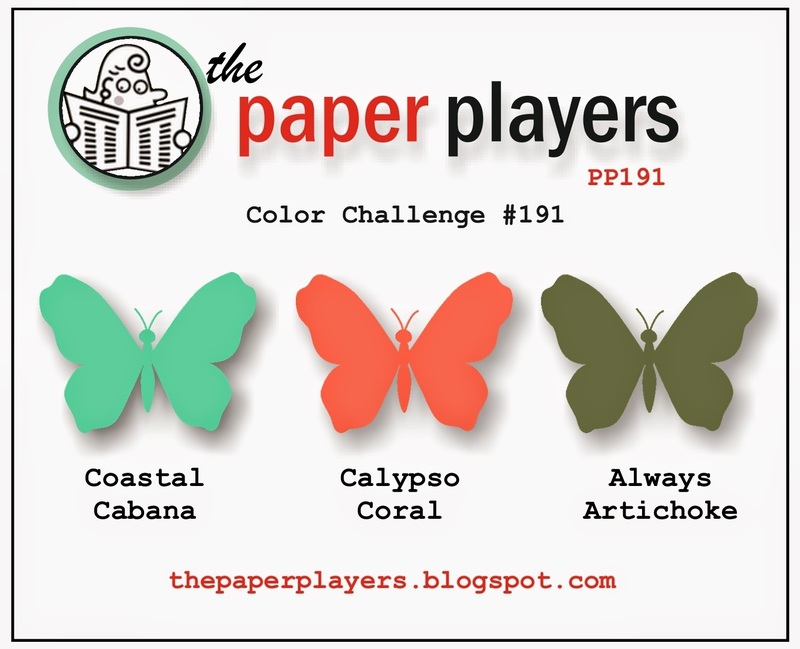 Thank you for playing with our Paper Player colors this week! Great job with the challenge colors, Brian! I love how you used only one little pop of coastal cabana and the flower is lovely. Thanks for playing along this week! Seriously! This is a great card, Brian !!! Love the layered labels! The flower cut out and layered on the wood grain is a great look. Was wonderful to get a Brian hug this weekend! Fabulous card, Brian! Love the layered labels and the way they trail off of the stem. Glad you persevered with the colors, you did them justice! Thank you for sharing with us at The Paper Players!